•	Choice of 16 Speciality Dining options* including: Cagney's Steakhouse, La Cucina Italian, Teppanyaki, Q Texas Smokehouse & Starbucks - what's more, some of these feature waterfront alfresco dining on the promenade! •	Mandara Spa with Thermal Spa Suite, Vitality Pool, Salt & Snow Rooms & the ships very own Barbers Salon! When you think Alaskan Cruises, one port city comes to mind, SEATTLE!!! Seattle offers more cruises to the Pacific Northwest and Alaska than any other port. 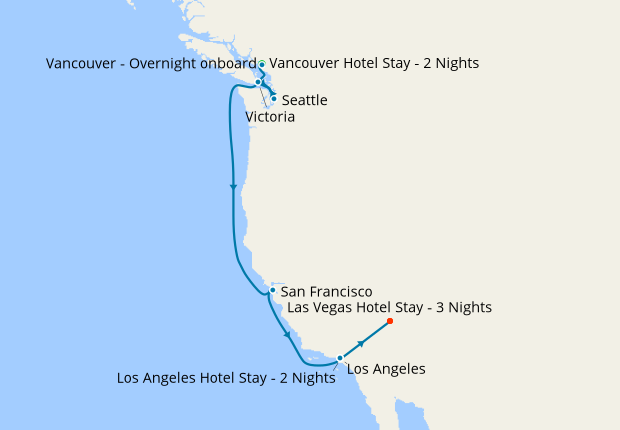 From here the Alaskan Cruises run from early May till late-September, with ports of call in eciting destinations such as Juneau, Ketchikan, Sitka, Skagway, Tracey Arm, and Prince Rupert. You'll find plenty of picture-perfect moments in this beautiful city, with its hilly streets, famous bridges and historic cable cars.